¶ Kevin Ayers (born 16 August 1944 in Herne Bay, Kent) was an English songwriter and was a major influential force in the English psychedelic movement. BBC DJ John Peel wrote in his autobiography that "Kevin Ayers' talent is so acute you could perform major eye surgery with it." ¶ Ayers was a founding member of the pioneering psychedelic band Soft Machine in the late 1960s, and was closely associated with the Canterbury scene. He has recorded a series of albums as a solo artist and over the years has worked with Brian Eno, Syd Barrett, John Cale, Elton John, Robert Wyatt, Andy Summers, Mike Oldfield, Nico and Ollie Halsall, among others. After living for many years in Deià, Majorca, he returned to the United Kingdom in the mid 1990s. He now lives in the south of France. His most recent album was Unfairground, which was recorded in New York City, Tucson, Arizona, and London in 2006. 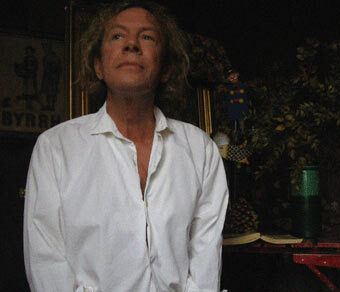 ¶ A gifted songwriter, guitarist, bassist and singer, Kevin Ayers has been flitting in and out of prog throughout his long, languid career. Present at the very beginning of the Canterbury Scene as a key member of the WILDE FLOWERS alongside such Canterbury veterans as Robert Wyatt, Richard Sinclair and Hugh Hopper in 1963, Kevin Ayers was already secured a place in Canterbury history. By 1966 SOFT MACHINE was born, and Kevin Ayers was recruited as a bassist and vocalist for the group. He lasted but one album before deciding he couldn't take the pace of touring, preferring to concentrate on solo efforts. In 1970 a somewhat formal band (The Whole World) was formed to help with Ayers' solo efforts which featured the likes of saxophonist Lol Coxhill and a certain young Mike Oldfield on guitar. Alas, the band was no more by the end of 1971. ¶ Ayers continues to play informal gigs as and when and may even swagger into the studio once more, but maintains as much of a laid-back attitude to these activities as his music itself exudes. ¶ For prog fans, the albums "Joy of a Toy", "Shooting at the Moon", "Whatevershebringswesing" and "The Confessions of Dr Dream" are of most interest as they contain reworkings of Ayers' early SOFT MACHINE material as well as copious very proggy pieces ranging drastically in style from lazy ditties to avant-garde sound explorations. After these albums Ayers' work became increasingly song-orientated and acoustic and may hold little fascination for the average progger. ¶ Highly recommended to all Canterbury enthusiasts and lovers of creative and finely crafted songs. ¶ The obvious Canterbury connections and excellent progressive material on several albums. © Kevin Ayers on stage, backed by Mushroom at the Great American Music Hall.